The Technomancer Companions Guide: Who Will You Take Around Mars? 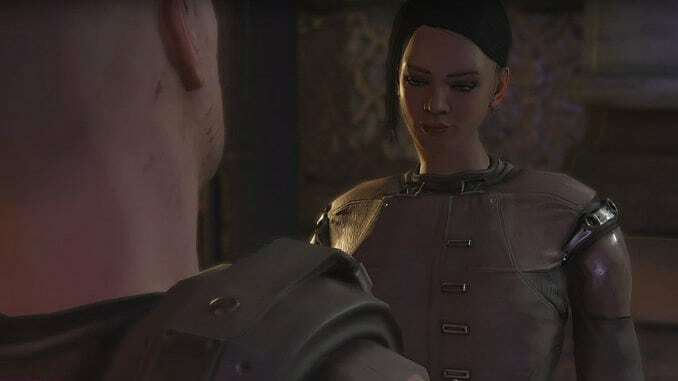 Neisha is the first female hottie you meet in The Technomancer. You can kind of guess that she'll eventually become a companion when you first meet her, although she deceives you by making you think she isn't much of a fighter. She's also one of the three romance options available. Neisha is a Rogue, so she has a bit of a spunky, bad girl type of personality. I equate her to be similar to Dragon Age 2's Isabela. Neisha came from a rough background, but tries to do right by those who take care of her. Spoiler: For example, there's a part in the game where she intervenes to basically make sure you don't walk into a trap. Neisha fights with a pistol and knife -- typical Rogue style. She can poison enemies and deals decent damage, but doesn't seem to have the health or dodging ability to last very long in big fights. ...Her AI just isn't the best. If you ask her to focus on Ranged combat, it seems like she doesn't really know what to do with herself. Personally I think there are better companions to take with you into battle. Neisha's passive is a Physical Damage from Daggers +2. If you're a Warrior like me... that's blah. Once you earn her Ally bonus, you get a +1 to Traps and Lockpicking. Nice! Neisha asks you to help a friend, which is a good idea to do sooner rather than later. She also asks you to help her investigate her background a bit. The Technomancer Combat Styles Guide: Which One Should You Play?